This week I decided to switch things up a little and review a sports bar that happens to also be a brewery, although they would probably have it the other way around. 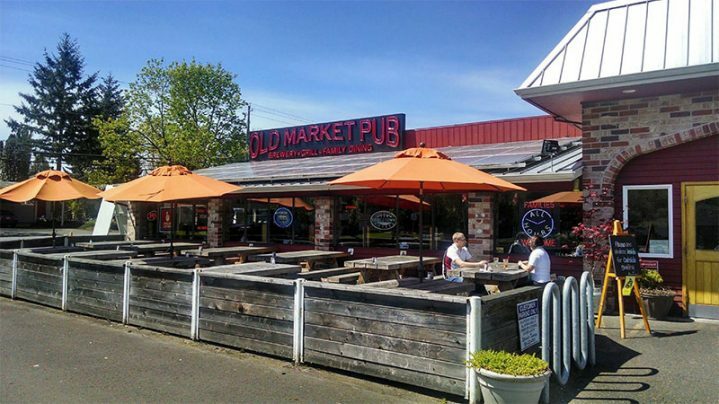 Nevertheless, Old Market Brew Pub on the Portland/Beaverton border is a great place for sports viewers and beer enthusiasts alike. O.M.P., as it is commonly referred as, is a family friendly establishment with a few areas off limits to minors including the bar, the pool/video poker room, and the shuffle board area. Seating is plentiful consisting of mostly booths and tables. There’s also a somewhat spacious patio perfect for enjoying craft beers on warm summer days. There’s plenty of fun to be had while tasting Old Market’s signature brews and noshing on the abundant and delicious food options available. As previously mentioned, O.M.P. has a pool room with 4 pool tables, a pinball machine, and 4 video poker machines. There are also 4 full sized shuffle board tables as well as a four-player PAC-MAN video game. All of these activities can be partaken in while never missing a moment of the action being shown on the 13 flat screens strategically placed throughout the brewery. Old Market Pub also provides catering as well as a banquet room nestled off to the side of the main bar area. It is spacious enough to host large groups for parties or meetings. O.M.P. has done well by providing a little something for every sports bar patron including the added benefit of brewing their own variety of tasty beers including Pinochle Pale Ale, Mr. Toad’s Wild Red, Black Magic Stout, and Hot Tamale, which is brewed with habanero and jalapeno peppers. Old Market’s happy hour menu is better than a lot of other’s main menu and they also offer $3.95 mimosas on the weekends and $3.00 bloody’s on Sunday. Old Market Brew Pub is great for families, date nights, watching the game, or for a quick pint or bite to eat. Is it a sports bar? Is it a brewery? Old Market answers with “Why not have both?” And I agree.